"Turning wood waste into wonders." Hines Wood Fiber Recovery & Processing recycles wood waste generated through manufacturing processes and other means. HWF&apos;s innovative methods recover vast quantities of accumulated or newly-generated wood waste. Hines Wood Fiber Recovery & Processing specialists divert materials destined for landfills into recyclable and marketable products. Hines has the best technologies available to save your time and money. Pre-consumer wastes (bark, limbs, cull logs, tree ends, etc.) and post-consumer wastes (stacking sticks, pallets, cross ties, etc.) are screened, washed and ground; then transported as necessary. Hines has the trucks, equipment and expertise to provide you with quality, worry-free wood waste removal. Pollution control and abatement - Since 1993, Hines has diverted hundreds of thousnds of tons of wood waste from landfills through our recycling process. Utility savings - Plants using wood waste as boiler fuel realize substantial energy savings in processing operations and increased co-generation activities. Job creation - A number of jobs have already been created through wood waste recovery, both directly and indirectly, with more to come in the future. Increased profits - Wood waste recovery creates sources of revenue from landfill materials and provides savings by reducing landfill fees. Alternative fuel for boiler systems. Gravel for road beds and other uses. Horticultural material (potting soil, mulch, compost bulking agent, etc.) for nurseries and landscaping. 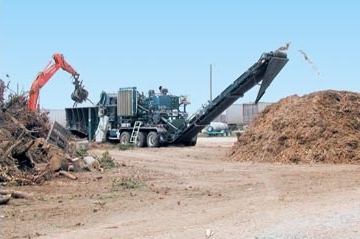 Hines Wood Fiber Recovery and Processing, Inc.